Dr. Eric Ferré, Department of Geology, Southern Illinois University, interviewee, and Emily Ferré, author. Mapping the Eagle Formation in Elk Basin, WY. Photo by Eric Ferré. Geology field camp will probably be the most challenging course of your undergraduate education, but it will also be the most rewarding. Field camp is a rigorous opportunity to apply classroom knowledge and transform yourself from student to professional geologist, while at the same time bonding closely with a community of other field campers. Yes, you will have to put up with some day-to-day challenges you rarely undergo in a classroom, but you will look back on what you learned, how you grew, and the adventure itself, as an unforgettable educational and life experience. That is why you leave the classroom to go to the mountain, trekking there with other campers by vehicle. During the drive to geologic sites, take the opportunity to look out the window, enjoy the scenery, and consider the geological implications of your new surroundings. Once on site, you will learn to use field gear, collect samples, draft maps, construct cross-sections, and solve problems. Since field camp is taught outdoors, expect the unexpected! Whether it be a road blocked by snow, a windshield cracked by a falling stone, a sudden storm, or a grizzly situation, prepare yourself for unforeseen circumstances that require your flexibility and patience. In case of unanticipated delays, consider bringing something to do, such as drafting equipment or some scientific reading. Vehicles only go so far, and after that you will trek by foot, sometimes for eight or more hours a day. You will need to be in excellent physical shape to get the most out of the experience, so train for endurance before the camp. Also, take care of your health during camp by eating balanced meals, getting enough sleep, staying hydrated, and yes, wearing sunscreen and a hat! All the outdoor exploration you do in field camp will boost your fitness level, so if you take care of yourself, you should feel great by the end. Measuring strike and dip, Bitterroot mylonite. Photo: Eric Ferré. Field camp is an intensive community experience. While most of your education requires an independent effort, field camp is a group undertaking. You will be spending an extended period of time with strangers, sharing rooms, transportation, and meals. That means you are responsible for showing up on time and doing your part. During the day, you will be teamed up with other students who depend on your participation and intellectual engagement to achieve common goals. In many cases, you may be participating in a field camp hosted by another university, so be prepared to adapt to a new teaching system with instructors who might have a teaching philosophy and expectations different from those of your home institution. Even if their approach is new to you, your professors likely have years of experience both as geologists and instructors, so you can trust them and their proven teaching methods to help you learn. Enhance your overall experience by making the effort to cultivate positive interactions with both students and professors, starting from day one. You stand a good chance of developing lasting friendships, so come with a good attitude and offer the best of yourself to bring out the best in others. 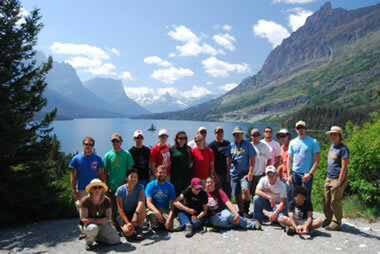 Geology field class, St. Mary Lake, Glacier National Park. Photo: Eric Ferré. Often the capstone course in a geology degree, field camp is more than an extended version of a weekend field trip or the lab version of yesterday's lecture. It is an immersion in experiential learning! Field camp focuses on hands-on training and problem-solving in a self-taught format that puts the emphasis on student initiative. No longer being shown exactly what to do, you will now take on the work of a geologist, with professors providing guidance that is largely consultative. Come to field camp ready to take the lead in your learning. Think about what you want to accomplish and get out of the experience. Set personal goals, and achieve them. Ideally, you will have multiple professors, who enrich field camp with expertise in various fields of knowledge. In this setting, you will start to realize that scientists often view the same phenomenon from different points of view, for example that of a structural geologist versus that of a geochemist. This is your opportunity to open your mind to the fact that science is not as black and white as the words in your text books. It is your chance to think for yourself. In addition to multiple professors, you will also be faced with the challenge of integrating information you learned in diverse courses. Most classes cover one subject at a time, but field camp involves many subjects blended together, including writing, speech, algebra, trigonometry, chemistry, physics, and oh yeah, geology. At field camp, the threads of knowledge from these different disciplines interweave themselves into a rich tapestry that brings to life the scientific principles of the physical world. Be prepared to use multifaceted knowledge to answer questions in geology. 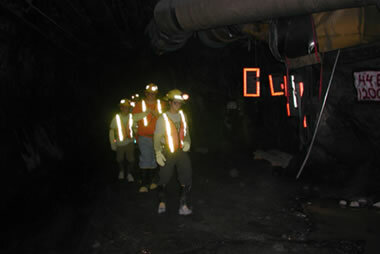 Underground at Stillwater platinum-palladium mine, MT. Photo by Eric Ferré. Field camp is not just another course. It is the rite of passage that transforms an apprentice into a self-reliant geologist. Field camp is meant to be a rich pre-employment experience which introduces students to many professional aspects of the career they will pursue. One of the most important aspects is field safety. Lessons vary, but here are a few examples: go to lower elevations during thunderstorms, refrain from throwing rocks off cliffs to protect people below, and never run from bears! Field camp aims to nurture qualities in students to make them more marketable to potential employers. Begin thinking of yourself as a professional rather than a student as you take on the real-world challenges set before you. Exploration -- Visit exceptional geologic sites, such as national parks and monuments, mines, and oil fields. Fun -- Choose your adventure on your days off. Go whitewater rafting, horseback riding, fishing, canoeing, hiking, and rock climbing. Watch rodeos and visit museums. Take advantage of some amazing locations. Try strange new foods, maybe even a wagon-wheel-sized blueberry pancake! Friendship -- Meet new people, including local miners, ranchers, and cowboys. Establish new friendships with your fellow campers. Many friendships endure long after the last day of camp. 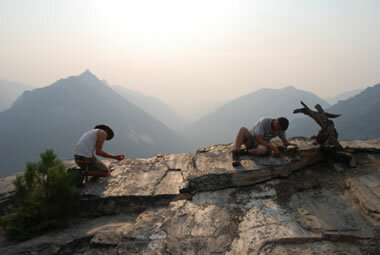 Experience -- Let geology come to life. You learned about glaciers in textbooks; now see them live (while they last!) in Glacier National Park. You learned about hydrothermal systems in the classroom; now see geysers in action in Yellowstone National Park. See fault scarps of historical earthquakes, go underground in an active mine, and find fossils. Nature -- Immerse yourself in nature and possibly come face-to-face with some amazing wildlife, such as moose, big horn sheep, buffalo, or bears, even mosquitoes. Repellent, anyone? Epiphany -- The hands-on nature of the course will help all the pieces come together and you will be able to say, "Now it finally makes sense!" Fitness -- After many days of hiking and mapping, your strength, endurance, and energy level will increase, and you will experience greater overall well-being. Self-Confidence -- When you accomplish real-world geology challenges, you will develop the confidence that will shine through in interviews and your career. Employability -- Gain marketable skills, and fulfill requirements by some universities to transform your degree from a Bachelor of Arts to a Bachelor of Science, a plus with many employers. Field camp is a once-in-a lifetime opportunity for action-packed learning! You will get out of it what you put into it, so bring your best attitude and make the most of each day. 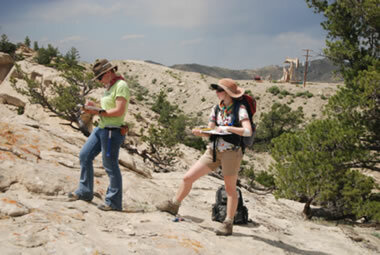 A unique experience in a geologist's career, field camp will bring you to a level you have never reached before. Many geologists still talk about their field camp experiences twenty years later. What stories will you have to tell? You will surely bring home more than rock specimens! Thanks to Dr. Eric C. Ferré, Department of Geology Southern Illinois University, and Emily C. Ferré, Writer, for contributing this article to Geology.com.